Thread: What makes the Noctigon m43 meteor such a successful light to this day? The m43 meteor seems to have made itself into stardom and that has not faded away like 90% most lights. What keeps this light relevant and in demand to this day? What other lights have made a name for themselves that werre released years ago and still a hot item today? Re: What makes the Noctigon m43 meteor such a successful light to this day? The M43 feels like a light ahead of its time, and I still have trouble finding some of its features on more modern lights. Nice LED options: XP-L H, 219C, SST-20. Great UI. 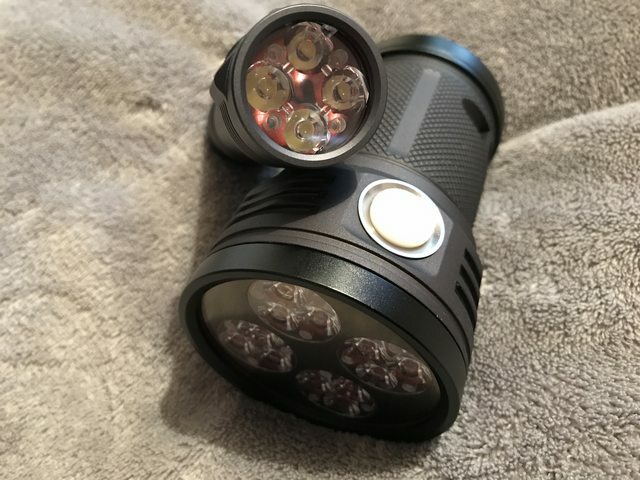 Advanced mode is very Zebralight-like. A possible programming setup is... From off: single click: low, double click: medium, short click + long click: high, hold: turbo. Then double click to cycle through modes. From any mode, hold to go to momentary turbo. There is also a ramping capability and two other UI options, if you want them. Light fades/ramps in transitions from off to on or from one mode to the next. RGB illuminated button that tells you interesting things: When off, indicates battery level. When on, flashes red to indicate output is throttled due to heat. When transitioning to a new power level, the LED color indicates brightness on a continuous spectrum (e.g., purple: low, green: medium, red: high, white: turbo). Short and stubby, actually feels like a small meteor might. The arrangement of 4 sets of 3 emitters looks neat. About a quarter-inch wider and a quarter-inch shorter than the D18 but contains 4 batteries instead of 3. Meteor is a great light. But I don't think I'll ever use my meteor again. The D18 is better in pretty much every way I use these kinds of lights. D18 is smaller, much brighter, has a better UI, etc. For me the quality and heft of the little best. Just feels solid in hand and weighty, knowing the internals are not cheap with corners cut. The design and easy to use side switch that (for me anyway) comfy and natural to use. Then at times, several colours to choose along with a good choice of LED and colour temps. An instant classic imho, now can (well not actually checked recent) for under 100 bucks!!! Hank just hits home runs one after another, now with the emisar range. The D1 and D4 with the awesome firmware, now under 40 bucks. For fun hand warmers that kick out a large amount of light, clever UI, you will struggle to find better all round value/package(cost/quality/UI/LED choice). Thank you, also to add, it is still maybe the only light i have that can fit in my coat pocket easy. Yet if needed can sustain 2500-3000lm for long durations getting to a "quite warm" temp level. Not struck on the ROT, but the D18 has my interest! I have a m43 with the xpg2. Its a nice light, but user interface is abit hard to understand.. agree with trailhunter. I don't think there's any other light in this price range that offers a boost driver for under 100$. As others have mentioned, offered in great LED options, and the size, fit and finish is impecable. There are other lights that may be brighter and noticeably more expensive, and they will all step down to similar levels of the Meteor anyways after a minute or two.